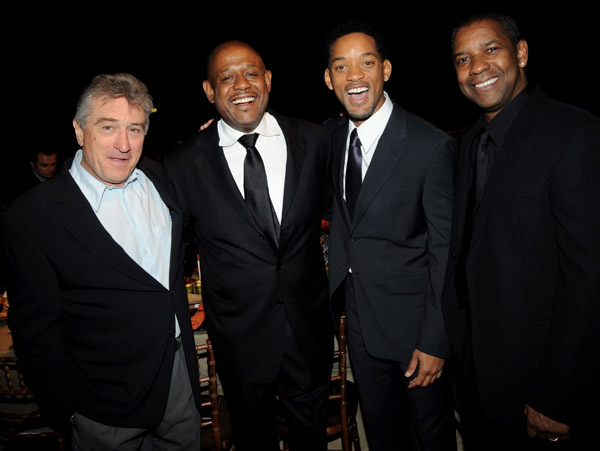 Bad weather was initially blamed for the lackluster performance of Will Smith's film Seven Pounds at the boxoffice. Now there are rumors that studio execs are pointing the blame at Will for not delivering. Maybe somebody should find whomever decided to market this downer organ donor movie mess as the "feel good movie of the holiday season." Will Smith's fans were obviously dissappointed by the bait and switch. 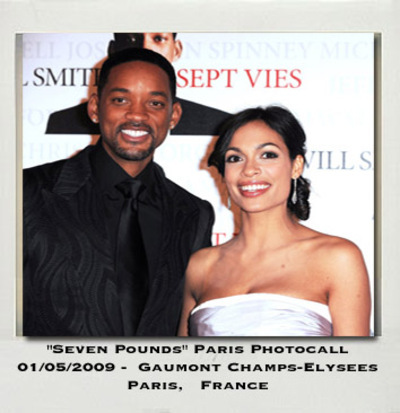 Will Smith and Rosario Dawson are promoting the movie overseas with premieres in Paris and Germany. Click here to read our Seven Pounds movie review. Click here for red carpet photos. Will Smith wants you to believe that Seven Pounds is a "feel good" movie of the holiday season. Seven Pounds isn't a heartwarming "male chick flick" about an IRS agent. It's actually about a man named, Ben Thomas, who is so depressed about a driving accident he caused while talking on his cellphone that he decides to "pay it forward" in honor of his victims. One critic described the film like Pay It Forward with organ transplants" with Smith portraying "a suicidal savior." This sums up the movie which doesn't really have much of a plot. Did you notice that Will Smith and Rosario Dawson deliberately avoided mentioning the movie during their press tour? Will and Rosario talked about Barack Obama, their brief love scene, golf, their family and everything else except key plot points in the script on Oprah. Watch a scene do what you promised me where Will Smith's character argues with his friend about his decision to commit suicide. The plot was so thin in this movie that we can't even tell you Will Smith's character's name in the film because it will give away some plot points and reveal too much of the story. Tom Cruise's son, Connor, makes a cameo as a young Will Smith in the movie to provide some exposition but he doesn't have any dialogue. We can say that Will Smith's character feels so grief stricken about the lives he changed the instant he didn't pay attention to the road that he decides to give everything he owns away including his life and belongings. How does it resolve anything if you fall in love with someone and then literally give your heart away? Rosario Dawson plays an ailing young woman who is dying from a heart condition. Will Smith spends the entire movie stalking Rosario's character and other characters like Woody Harrelson's blind man with pained expressions on his face. It is a fact that the topics of race and ethnicity are never discussed in this film but it just doesn't make any sense for Will Smith's character to be flashing an IRS badge and magically appearing at people's front doors. This character is a Black man in America and there are certain things he shouldn't be doing like running down the street in the rain for no reason. There was a scene in Lawrence Kasdan's 1992 film Grand Canyon when a culture shocked African-American teenager is running down the street in LA for no reason and the cops pulled him over. That would have been more realistic but this movie is dealing with sugar coated organ donor idealism which is likely to depress the audience and is far from uplifting. Here are some other examples of the times when Will's character is in creepy full stalker mode. 1. The scene when Will's character appears in Rosario's front yard and feeds food to her dog. 2. The scene when Will Smith shows up unannounced and appears pulling weeds in her backyard. 3. The scene when Will Smith breaks into Rosario's house while she is sleeping and fixes her broken printing press. Will Smith has been using his charm and personality to sell this film as something that it isn't. The key to Will Smith's successful career has been his likeability factor with audiences. Spoiler Whiners Beware: Just to be fair about things, N.Y. Post critic Kyle Smith is calling Seven Pounds the third-best movie of '08, or at least his choice for same. This Gabrielle Muccino-Will Smith film, he says, is "simple but perfect, so classically structured that, except for the modern technology in it, it's like a redemption fable handed down from the ancients." Smith's critical colleague Lou Lumenick, already concerned with Smith's growing grandiosity, feels differently. He says -- HERE IT COMES, SPOILER-AVERSE! -- that Seven Pounds (Columbia, 12.19) "should be more accurately titled Seven Hundred Pounds of Schmaltz...it's like Pay It Forward with organ transplants" with Smith portraying "a suicidal savior." “Seven Pounds” slogs about, impressed with its own supposed depth, as we watch Will Smith play a man attempting to pay for his past sins. Director Gabriele Muccino (“The Pursuit of Happyness”) seems to think he’s in Ingmar Bergman territory, but he’s actually made the longest, most dour episode of “My Name is Earl” imaginable. The film begins with Ben Thomas (Smith) calling 911 to report his own suicide — this literally happens in the first five seconds, so it’s not a spoiler — and then, rather than putting all of us out of our misery at the same time, “Seven Pounds” spends the next two hours telling us how he got there. Will Smith gave a candid interview and spoke about his "open relationship" with his wife Jada Pinkett Smith. 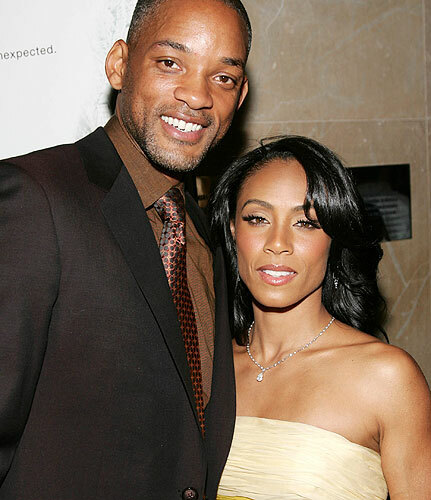 Will Smith has said that "divorce is not an option" when referring to his marriage with his second wife Jada Pinkett Smith. It's no wonder that divorce is "not an option" if monogamy isn't part of your marriage and you can hook up with anyone you want. Charlize Theron confessed that she fell in love with Will Smith while making their movie Hancock. In a candid interview with UK magazine Reveal, he suggests that having an open relationship is one of the secrets to their success. "Our perspective is, you don't avoid what's natural and you're going to be attracted to people." he says. The 39-year-old star explains that the couple's open policy has been in place from day one of their 10-year marriage. Other things that Will says are important in his relationship are keeping in shape for his "little firecracker" Jada, the "look in her eyes", and communication. Will Smith and his co-star Charlize Theron attended another Hancock Premiere in Los Angeles at Mann's Chinese Theater. 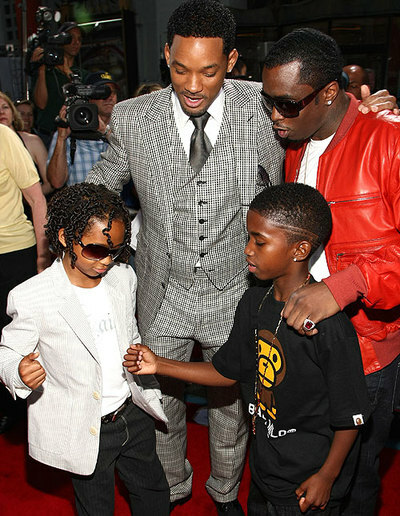 Diddy and Will Smith brought their kids to the premiere too. Jaden Smith and Christian Combs look like their powerful rap mogul dads. We see a collabo in their future for the rapper's kids. Maybe the Jaiden Chris act can sing a remake of "Parents Just Don't Understand". We think the introduction to the pair would be a description like "Meet the Fresh Prince and Diddy Mini- Me's." Jada brought the whole family to support their dad. Willow has a role in Kit Kittredge: An American Girl" which opens the same week as her dad's film. Hancock opens tomorrow on July 2nd. It's Big Willie Weekend. The film is getting mixed reviews on Rotten Tomatoes. Check out pics from some of the other celebs who attended like Jada Pinkett Smith, Lisa Raye, Tatiyana Ali and Tia Mowry. We know that Queen Latifah attended but we don't know what she was wearing or why she showed up on the red carpet wearing an outfit that looked like gym clothes. Don't even get us started on what Willow is wearing. We know that Will Smith is going to do well at the boxoffice. We just wonder why it took so long for the studios to make an African-American superhero film beside the Blade series starring Wesley Snipes. We have heard a Hollywood director say that Will Smith is the only African-American actor & producer in Hollywood with enough power to greenlight a studio picture. Denzel Washington doesn't even have as much power because his overseas boxoffice isn't as strong as Will Smith who is an international boxoffice star. Hancock premiered in Germany, London, Moscow,Paris and Los Angeles. Will Smith was just named the "Most Powerful Man in Hollywood" and commands $20 million dollar paydays. We just think that Will Smith should be more protective of his image when he portrays certain characters. Our favorite Will Smith role is when he played a loveable con man in "Six Degrees of Separation". Will Smith was so convincing when he portrayed that character and recited his monologue about "Catcher in the Rye." The Hancock action hero character is superhuman but he is a drunk who literally can't fly straight and has no personality. Robert Downey Jr. is a real life crackhead who was repeatedly busted and jailed for crack cocaine possession. However Robert Downey Jr.'s character in Ironman fits the action hero template and is a sober competent superhero. Imagine that the word "a-hole" — fully spoken out — is repeated over and over, and that its first appearance, in the movie’s first scene, is delivered by a child. Thus, the vulgarity begins. But unlike other crass films of this month, such as "Zohan" and "Love Guru," the coarseness of "Hancock" is a wildly under-calculated mistake. Hancock, preposterously, is an unwilling superhero. He’s a drunk, a hobo and — to be frank — an "a-hole" so lacking in charisma, charm or even bravado that there’s nowhere for him to go but down from a low rung on the ladder. Unlike Smith’s cocky, smiling heroes of the past, Hancock is just offensive and stupid. His favorite warning to those he’s about to pulverize is an admonition that at least one of his villains will wind up with their head relocated in Hancock’s derriere. True enough, one time we get to see this and it’s not pretty. It’s not funny, either. The screenplay, which is underdeveloped to the point of amazement for a Hollywood summer blockbuster, is credited to Vince Gilligan and Vincent Ngo. That they’ve done Smith a disservice is an understatement, but their other victims are Charlize Theron, Jason Bateman and a little boy named Jae Head. Their characters literally are abandoned to incoherence. An hour and 20 minutes later, here are things you will not know: who Hancock is, where he and Theron came from (it’s telegraphed with the subtlety of a mallet that she has a past with him) and who the persons fighting them are (I have no idea). This much we know: Hancock, whom we meet as he awakens on a park bench from a drinking binge, has powers of flight and super strength. He either can’t or doesn’t want to control them. He’s belligerent and obnoxious, a sort of anti-hero who in comic books usually is defeated by a good guy.The latter is something he doesn’t want to be. When Bateman’s PR guy shows Hancock a bunch of comics featuring superheroes, Hancock’s response to each one is "Homo." Charming. It is said the legion of writers and directors who came and went before "Hancock" was initiated had a "black" comedy in mind — something that sent up the idea of superheroes. But a mess has been made in the process and $150 million wasted. Congrats to Will Smith on being named by Newsweek as "The Most Powerful Man in Hollywood." Will Smith has been officially awarded the 'Most Powerful Man in Hollywood' by the US magazine Newsweek - after almost every one of his movies delivered a first-weekend gross of 30 million dollars or more. The 39-year-old rakes in more than 20 million dollars per film, with his career to date generating box-office sales of more than 5 billion dollars worldwide, reports The Daily Telegraph. His last film alone, 2007's I Am Legend, debuted with a staggering 76.5 million dollars. Oh hell no...Jada you had better get your man! Charlize Theron was all over Will Smith at the Hancock premieres in Paris and Germany. Now Will Smith who has said "divorce is an option" is not holding back on the PDA's with his co-star Charlize Theron. Jada watch out because the movie is called "Hancock" and it look's like Will might be trying to upgrade you. Will is the biggest movie star in the world. Will planted a kiss on the back of his co-star Charlize Theron's neck at the Hancock London premiere. Jada don't forget to take off your earrings when you go ghetto on Will and pull out Charlize's perfectly styled hair. Jada used to be down with Tupac so we know she has knowledge of the thug life and can be a ride or die chick. 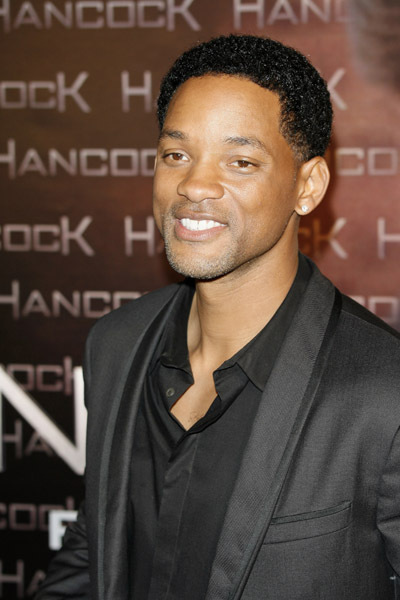 Will Smith attended the film premiere for Hancock. Oscar Winning actress Charlize Theron was all over him and planted a kiss. Oh no she didn't. Eva Longoria also attended the premiere with her husband Tony Parker. Jada you had better get your man. Will Smith and his wife Jada Pinkett-Smith showed their affection for each other while sitting courtside at the Lakers Celtics game. 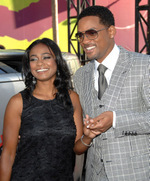 Jada showed her love with a kiss and Will Smith pretended to wipe it off. Here's Will Smith and wife Jada with their adorable son Jaden. Charlize also got close to WIll Smith at the MTV Movie awards. On Monday, June 16, night, the film about the misunderstood hero rolled down its the red carpet at the L'Olympia Hall in Paris to celebrate its special screening. Though the special event was thrown far away from Hollywood, it was still attended by its key people, including Will Smith, Charlize Theron, Jason Bateman and director Peter Berg. Moreover, the event also saw several celebrity guests from the city of light, such as comedian Dany Boon, singer Ophelie Winter, professional basketball player Tony Parker, as well as from the U.S., namely Eva Longoria. Will Smith and his family were out for the "Kit Kittredge: An American Girl" World Premiere at the Grove in Los Angeles. 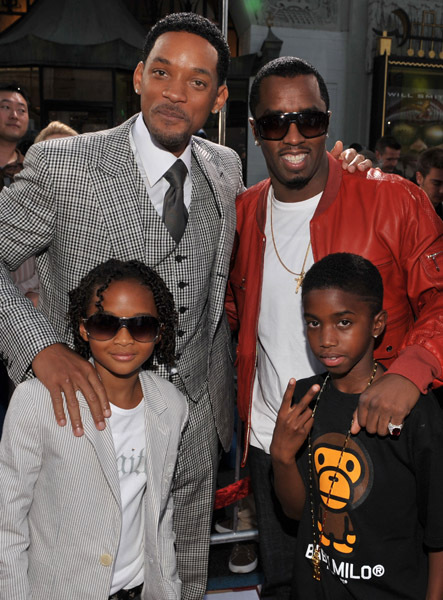 Will attended with his wife actress Jada Pinkett-Smith and their kids Trey, Jaden and WIllow. Doesn't everyone look adorable? 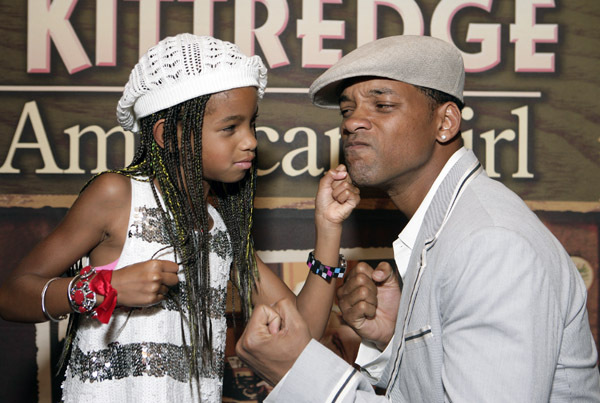 Will Smith had a little daddy time with his daughter Willow. Happy Father's day Will. Will Smith's new movie Hitch Hancock opens on July 2nd. Will Smith spoke to Ellen DeGeneres about the secret to his marriage with his wife Jada Pinkett Smith. He tells Ellen that "divorce is not an option." Wow. Will Smith really believes in that whole "till death do us part" marriage vow. This is Big Willie's second shot at the marriage thing. He was divorced from his first wife when he married Jada Pinkett. Here's a first look at the new movie Hancock starring Will Smith.